The Kwara State Chapter of the Association of Nigerian Authors (ANA) in collaboration with the National Library of Nigeria, Kwara State Branch is set to mark this year's World Poetry Day with a public presentation of an anthology, Harmonious Chronicles. The event which will hold on Thursday, March 21st, 2019 is expected to take place at the Mustapha Akanbi Library and Resource Centre, No. 6, Agba-Dam link road, G.R.A, Ilorin, by 9am prompt. The PRO of the Local Organising Committee (LOC) Mr. Abdulhafeez Oyewole disclosed to the press, that the anthology is dedicated to the memory of late Justice Mustapha Akanbi. 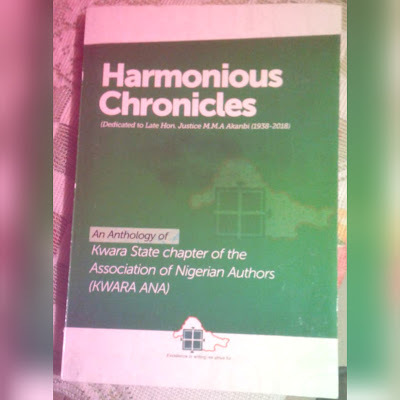 In his words, "The anthology is a literary compendium dedicated to the pillar of support and benefactor of the Association of Nigerian Authors, late Honourable Justice Mustapha Muhammed Adebayo Akanbi, CFR, PCA, who departed this earth last year. "We therefore invite writers, authors, literary enthusiasts as well as the late jurist's proteges, friends and associates to celebrate with us as we remember this icon and our own incorrigible judge." According to him, the event will afford both upcoming and established poets the opportunity to display their talents. "To this end, interested performers at the event are to send in their well edited works of salient themes to kwaraana15@gmail.com for scrutiny and prior approval by the Local Organising Committee (LOC) before the D-Day. "The subject of the work should be, Work to present at Kwara ANA's Harmonious Chronicles public presentation and should be sent as a single MS Word attachment or copy-pasted in the body of the mail," he said. Expected at the event are academists, legal luminaries, literary scholars and other important dignitaries in all walks of life. Dr. Mahfouz Adedimeji of the university of Ilorin will review the book. The World Poetry Day is an annual event observed every 21st of March. It is a day to encourage people to read, write, teach, and publish poetry and to recognise the great cultural contribution poetry makes to human society.